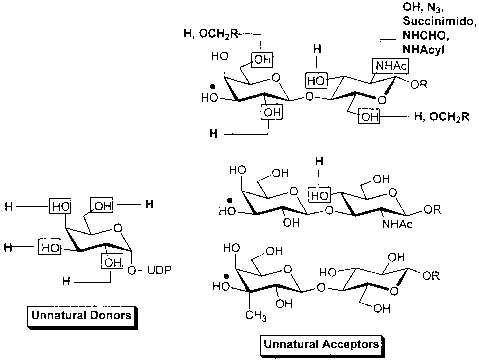 Figure 5 Unnatural donors and acceptors for a!,3-galactosyltransferase. the enzyme . a1,4-Galactosyltransferase from Neisseria meningitidis transfers Gal from UDP-Gal donors solely to lactose acceptors yielding globotriose [62,72]. The enzyme will transfer arabinose, 2-deoxy-, 4-deoxy-, and 6-deoxy-Gal from modified donors from 2 to 28% of the rate of UDP-Gal; however, 3-deoxy-Gal is not transferred . Large-scale production of UDP-Gal and globotriose (188 g/L) has been achieved by metabolic engineering of bacteria .